Images found on this site are used as guides and occasionally an item may need to be substituted for similar product of same or greater value. Contents for each product may vary slightly due to regional & seasonal availability. Send a Basket reserves the right to make fair and reasonable substitutions according to the practical availability of stock items, flowers and containers. All prices quoted, unless otherwise stated, are inclusive of GST. All prices, unless otherwise stated, are quoted in Australian dollars (AUD). Product prices do not include delivery fees. All delivery requests are approximations only. While we endeavour to deliver by the date requested, this is not always possible due to unforeseen circumstances. We use reputable couriers and whilst every care is taken to ensure accurate and safe delivery. Delivery not made on an exact date does not constitute a failure of our agreement, and does not entitle you to cancel an order. No deliveries are made on weekends or public holidays. Delivery time frames are shown in business days and are intended as a guide only. Please view our delivery times carefully. Please enter all delivery details carefully. Inaccurate or misspelt delivery information often results in delays in delivery. If Send a Basket incurs extra costs by our couriers, due to inaccurate or inadequate delivery details, that charge will be passed on to the sender. We will not accept liability for items lost, stolen or damaged after delivery has taken place. This includes loss or damage resulting from delivery to unattended addresses, whereby the sender has opted to have the gift left at front/back door if no one is home. For more detailed information on deliveries, please visit our page titled “Delivery”. Gifts including alcohol may only be purchased and delivered to persons over the age of 18. 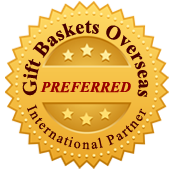 Purchaser representation: by placing an order with Send a Basket, you, the purchaser represents that they and the recipient, are over 18 years old. The purchaser accepts that it is an offence to falsely represent they are of legal age to purchase alcohol and to obtain alcohol on behalf of a person who is under 18 years. Upon delivery of our products, the recipient may be required to provide a valid ID for proof of age and sign for the goods. When purchasing with Send a Basket, you are agreeing to receiving our emails, offers and updates, which can be unsubscribed to at any time.